3/8" Hose ID x 1/4" Hose ID Black HDPE Reducer Connector | U.S. Plastic Corp. 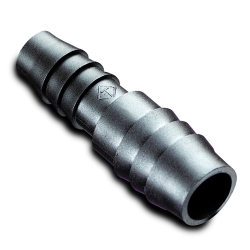 These black fittings are made from a high molecular weight linear polyethylene. They are formulated for chemical compatibility and high impact resistance at lower temperatures. The temp range is -65° F to 190° F and the working pressure of 125 psi max, with appropriate clamps. They are UV resistant and NSF 61 listed.